Microsoft is currently working hard to release a minor update to its struggling Windows 8.1 version. Windows 8.1 Update 1 ( aka Feature Pack for Windows 8.1), which has already been leaked on to the web last week, brings ability to pin Modern or Metro apps to the taskbar, minimize and close buttons to Metro apps, shut down and search buttons on the Start screen, and more. Windows 10, the next major version of Windows will reportedly land in the last quarter of this year or in the first quarter of 2015 for sure. Microsoft, though hasn’t revealed anything about Windows 10 so far, is expected to show its next version of Windows operating system in this year’s BUILD event, which is scheduled to happen in April. Some sources are also hinting that Windows 10 will reach RTM stage by the end of May, 2015. Even though there is no information available and no one outside the Microsoft campus knows what Windows 10 will look like, according to some Windows experts, Windows 10 will ship with a mini-Start (Metro-style!) menu, taskbar for the Start screen, and more personalization options among other features. But Microsoft’s silence on Windows 9 is not stopping Windows enthusiasts from creating Windows 10 concepts and transformation packs. If you’re looking to try out a Windows 10 transformation pack on your PC, you can now download Windows 10 Skin Pack for your Windows 8 and previous Windows versions. 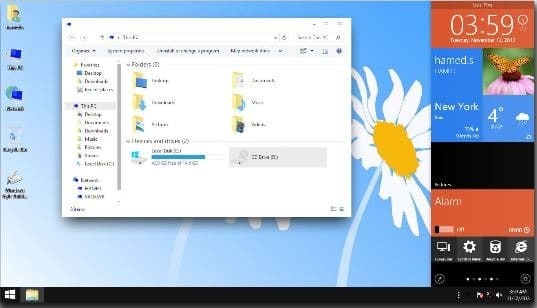 Windows 10 skin pack is the first version of the transformation pack and doesn’t include features that you might see in Windows 10, as Microsoft hasn’t shown us what Windows 10 will look like. It just includes some tweaks for Windows Explorer (File Explorer), taskbar and the desktop. So, if you’re looking for a transformation pack that can transform your Windows 8.1 or previous version into the actual Windows 10 (that we haven’t seen so far), you’ll have to wait for a month or two. We encourage you create a manual system restore point before installing transformation packs, as most of the transformation packs out there can’t easily be uninstalled. Windows 10 Skin Pack (transformation pack) is available for both 32-bit (x86) and 64-bit systems (x64). As you can see in the above screenshot, Windows 10 Skin Pack offers you add HQ-Videos Pro to your web browsers. If you aren’t interested in adding it, please click the Skip button when you see the above screen. I really wish this worked. It mean, it does… But everytime I reboot my PC, if I want to retain the W10 settings, I need to run the installer, uninstall the uninstaller so that I can re-run the installer to re-install UxStyles and the Theme. After that, the settings before reboot are restored, but it’s hardly practical to have to do this every setup. Can anyone help me fix this or determine why everything is resetting to normal, especially if the explorer.exe is being modified? We do have mentioned in the article that the setup of the skin pack offers you install unwanted program and have also mentioned how to install the skin pack by skipping other programs. As we have mentioned in the article, you should have created a restore point. 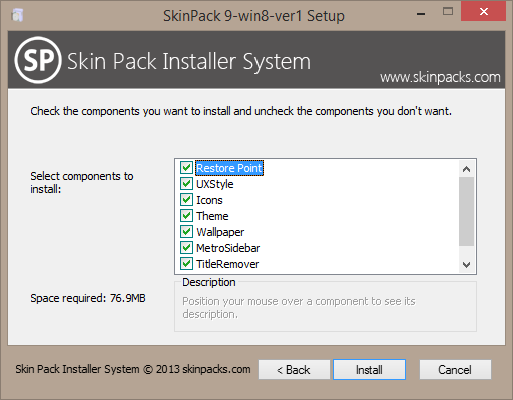 Windows 9 Skin Pack also creates a restore point before beginning the installation. Please check if there is a system restore point and use that restore point to revert system settings and other things.